After the last-minute dithering which the weather has made the norm this year, a depleted band of 4 ended up at Peak Scar. Carmen decided on a repeat lead of Frenesi (VS 4c ***), which after one false start and an extended stay on the ledge below the crux, she managed with ease. Despite having previously onsighted the route, I managed to scare myself silly and fell off the crux, no doubt to the amusement of Gordon and Dave who were climbing Wings at the time. In a vain attempt to salvage some self confidence, I finished the evening with a lead of Downbeat (VDiff) while Gordon looked on from Walkin' (Severe) next door. A grey overcast evening but despite a brief attempt, the rain held off. Not the best evening's climbing of the year, but better than staying at home! The unexpected arrival of a good weekend's weather forecast meant some last-minute changes of plans, so Carmen and I drove over to the Lakes on Saturday morning with the aim of getting to Great Gable the next day. Having pitched the tent we popped up to Honister for some afternoon climbing on Buckstone How, expecting to have to queue for a bit as the crag is a quick-drying suntrap with a 10 minute approach and several starred routes mainly from HS to HVS. But the place was deserted so we had our pick, and opted for Honister Wall (HS 4b **). A minor classic on natural slate, with excellent climbing on each of the pitches (6 in the guidebook, we combined some and did it in 4). In the early days there was lots of loose rock around, but this has all gone in the intervening decades and so long as you stay on route it's as solid as any other mountain crag. We followed this with Groove One (VDiff) as it got a star in the old guide. We later found that this star has disappeared in the latest update, and with good reason! The second pitch is a fine groove, but to get there you have to wander up nasty unprotected vegetated ledges. Not recommended. The next day we started early to avoid the expected crowds, and got to Tophet Wall (HS 4b ***) just before 10, to find we were the first team there. I led a long first pitch (guidebook pitches 1+2), and Carmen followed suit with a long 2nd pitch (guidebook pitches 3+4). Another pair arrived as we were part way up, but otherwise nobody else did the route all day. Weird. 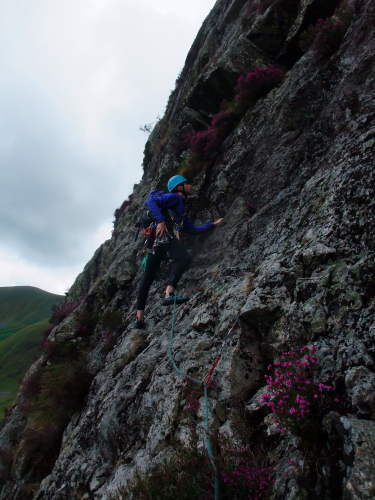 A truly great route, rightly considered one of the best in the country. Next we wandered over to the Napes to see if anyone was climbing the Needle. They weren't, so we did. It's either got harder since I last did it about 12 years ago, or I've got worse, probably both! But we managed it, Carmen led Wasdale Crack to the shoulder, then I did the last short pitch to the summit. HS 4b *** but much of its quality comes from the history and the situation rather than the climbing per se. Again, we were followed by the pair from Tophet Wall, but nobody else on the route for the rest of the day. A handful of other teams doing other routes – Needle Ridge, Eagles Nest Direct, The Cayman – but overall very quiet for such a classic area on one of the only sunny weekends of the summer so far. Still plenty of time left, we decided to finish with Needle Ridge (VDiff ***). We did this in 3 pitches, I began with the variation arete start to avoid the polish on the normal, excellent grippy rock but not much protection. Carmen took the long interesting central section, then I finished up the final groove, taking another variation on the right up excellent twin jamming cracks. A scramble along the rest of the ridge finished off yet another excellent route, much better than I was expecting after paying too much attention to exaggerated reports of polish. We'd carried our kit up the route so finished by walking over the summit of Great Gable, then via Green Gable back to Seathwaite. The beauty of having a hut booked is that you can shelter from the insistent rain, like what is always falling from the sky in Wales. I guess a prerequisite for that to be true is that you can locate the bloody thing in the first place! Arriving about 10.30 with print out and map, we headed to the grid ref, where there is nothing, save a track and a gate. We drove around the village (twice) and back up the track. Jamie and Paul arrived. We all drove around some more. Jamie returned with a Bradshaw in tow. Some more pondering much internet activity and failed phone calls we resorted to trying the key in random doors! Eventually Paul struck Gold – Number 18 penultimate house in the terrace. A good hut if a little short on drying space given this is Wales and we got all soaked! A fire lit, tea on and all is well with the world. John was joining Pete E in the morning and all 6 of us had plans to climb despite the forecast. Jamie and Paul decided to check out the nearby MTB trails and cafe, returning with half a hillside of mud plastered to their clothes. Pete and John did a ride further south near Cader and Pete B and I drank tea. The forecast was very specific – dry from 3 till 6. After a lunch we drove down past Dolgellau to the picturesque and largely deserted Cwm Cywarch, our Classic Rock objective Will o' the Wisp (HVD). We reckoned it'd be fine even if raining, but we let the final showers pass while listening to Shelia Hancock reminisce on radio 4. A shortish walk, tons of bilberries and a bit of messing about saw me starting the first pitch. A short section of rock towards a tree and a block (I think these have gone) then a filthy soggy slab and a few more moves to the large ledge. Pete leads through a small wall, then takes the next two pitches, a huge easy, enjoyable traverse across the face. 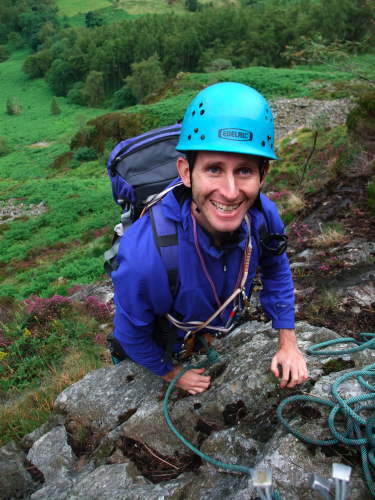 An unlikely move around an exposed arete on huge jugs, brings a smile to my face and a tree belay on the final ledge. A quick jaunt to the top before the rain arrives on cue as we are coiling ropes. Late back we all chip in to cook and drink a late meal before heading upstairs to the comfy warm beds. Sunday's weather is shite, rain rain rain. Pete and John head off to the MTB tail, the rest of us decide to wander up to Cnicht via the old slate workings. It was pretty grim but a nice stretch of the legs and some interesting industrial landscapes. We got back about half three, Pete had got back early and had a snooze, cleaned the fire, so we had some more tea, showered, cleaned up and left. A good comfy hut (sleeps a dozen just) in a good place for mid grade climbing – not that we troubled it this w/e – and closer than LLanberis, a good place for those heaving weekends, also a pay by bed so should be good for small meets. We were due to join the club in Blaenau Ffestiniog, but the forecast was awful and we couldn't face yet another weekend of walking up wet Welsh hills, so decided instead to walk up some wet Lancastrian hills. The Bowland Challenge has been running for about 5 years now, and YAC have entered one or two teams every year (except last year when it was cancelled due to access problems). Rather embarrassingly, after finishing 2nd in the first event, we have won it every year since. It's a sort of cross between a score orienteering event and a treasure hunt. There are somewhere between 70 and 100 controls worth between 2 and 20 points each, and you have 10 hours to score as many points as possible. With this number of checkpoints it's not possible to put control markers out, so instead there are grid references with associated "clues" with multiple choice answers, things like "during whose reign was the post box built?" or "what is the number of the trig point?". And to add a bit of complication, there is a designated "lunch" spot part way round which you have to visit, and you also have to say what time you'll get there. Too late and you lose points, too early and you can't set off again until the appointed time. We decided on a long anti-clockwise loop, with a lunch stop at Langden Castle in the heart of the Bowland Forest (it sounds romantic but is actually just an old barn used as a shooting lodge). In the morning we stayed mostly high, in near-constant wind and rain, we were so wet it was actually good fun (apart from one section through continuous peat bogs). We walked most of it but were forced to run down the last valley to avoid being late for our lunch stop, which we made with a couple of minutes to spare. After lunch, most of the route was unfortunately along roads – the organisers had had to cancel the intended checkpoints on the hills as the grouse were late fledging and the landowner didn't want them disturbed before they're shot next month. But the scenery through the Trough of Bowland was good anyway, and better still it stopped raining, with even some sunshine at times. We failed to find a couple of the checkpoints but rather than waste time looking, we just ploughed on, again walking throughout until forced to run the last half mile to return to the event centre a minute early. We covered about 32 miles with 1200m ascent, and managed to win again. If only the winners from the first event would show up again, or maybe some proper fell runners, and return us to our rightful place as also-rans! Great organisation as usual, I'd recommend the event to anyone wanting something a bit different. More information about The Bowland Challenge. Peri's Monday night, easy action routine continued last night with Cef, Jamie, Courtney and I accompanying her to Brimham. Despite a few spots of rain on the way we walked into Cracked buttress/ lovers leap where the sun was shining. As Peri and Courtney set about the chimney, I led Jamie and Cef up Birch Tree Wall with its suffering placements but still a great route. 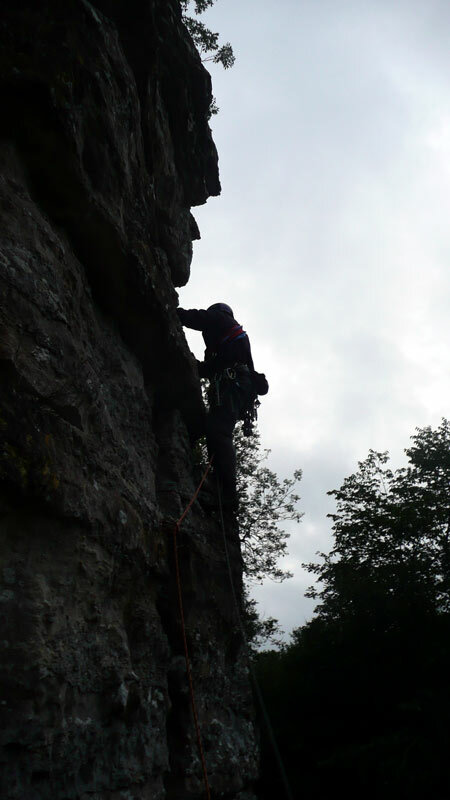 I suggested Jamie lead Difficult Crack, a well protected and fun little route as it was getting dusky. He eventually gave up looking for excuses and got on with it, a no fuss ascent which Cef and I followed. P&C set up an abseil and we all packed up after dark went of for a quick beer in the New Inn (which is all changed) before heading home. The last couple of mondays a few of us have gone out with the aim of having some very easy going evenings where people could have a first go at trad climbing, get back into practice or just chill out a bit and have an easy evening. Our first session was at almscliff, where Jamie and me introduced Courtney to the delights of english grit. 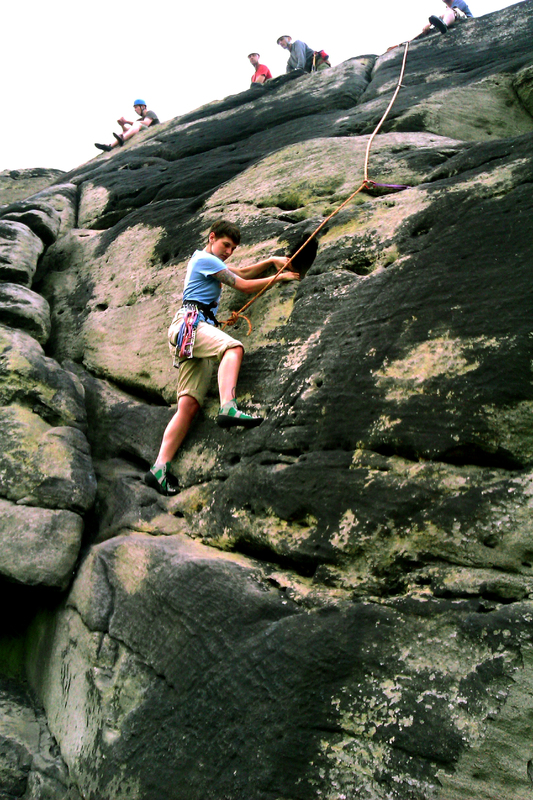 Contrary to popular belief, Almscliff does in fact have some easier routes, and nothing we did was at all strenuous (apart from the final chimney). As Courtney had never climbed trad before Jamie led most of the routes, Courtney seconded. Courtney has sport climbed in the Swabain Alps, which is limestone but she seemed to have no trouble at all adapting her style to grit, and flew up Easy Way, Stewpot and Fluted Columns on second. Then the foolish girl revealed she quite liked chimneys, say no more, we headed for South Chimney as the last route of the evening. Courtney found it "awesome", Jamie declined to follow (not a chimney fan then). This monday we headed for Brimham with Dave Shield and the Lesser Spotted Cef. Cef announced this was the first time he had set foot on british rock this year! Didnt stop him leading a route, and his long climbing experience came in very handy later on when….Courtney led her first trad route ever. I went up the route first, pre placing sufficient good gear to safeguard her (daves cunning suggestion), then ran back down to belay while courtney led up placing the rest of the gear, Cef supervising the belay at the top. It was quite a hard lead for Courtney, Heather Wall (severe) as it has a bit of a thin slabby start, but she was very cool and calm, and her gear was all solid; I was impressed. Hopefully the weather will let us get a few more sesssions like this organised over the next few weeks. Indecision about the weather meant a last-minute choice of Raven's Scar for this evening. It had been dry all day in York, but as we neared the crag the wet roads told us that Clay Bank hadn't been so lucky. Having got that far, we thought we might as well go for a look at the crag, which turned out to be fairly dry, and also covered with members of the Cleveland MC. Plenty of routes to round though. Roy's introduction to the crag was to follow Carmen and I on a fruitless search for the whereabouts of Galaxy (VDiff *). We've tried and failed before to find it, I think it's the figment of someone's imagination. Having given up on that, I went for a quick lead of Airlift (S) via the variation start. The word "quick" only being true in a geological sense. By the time I reached the top the others were showing the first signs of frostbite in the northerly wind. While this was going on, Will and Rob made genuinely quick ascents of Ahab (HS) and Forest face (HS), before deciding to slow things down with a protracted siege of Jonah (VS 5a "my arse"). This took up enough time for the 3 of us to tick off Forest Face, after which most of decided it was too cold to climb anything else. But Rob and Will were in training for winter hot-aches so finished with En Passant (S). One of the best crags in the Moors in the right conditions, which unfortunately weren't in evidence this evening! At last, a weekend of warm dry weather, perfect for climbing or a nice walk in the hills. So of course we were doing the Saunders Lakeland Mountain Marathon, 2 days of running up and down hills carrying camping gear. This year we started at Chapel Stile in Langdale, and headed for an overnight camp at Steel End Farm near Thirlmere. YAC was represented by Carmen and me doing the Bowfell (all the courses are named after hills); Alan and Peter doing Carrock Fell; and Graeme and non-YAC Will on Kirkfell. This year's courses were tougher than usual, so everyone suffered. Ours went northwards over the hill and into Easedale, before heading north west into Langstrath. Here we had the first major route choice of the weekend – contour round Langstrath or go down to the valley bottom and up the other side. We opted for the latter, with hindsight (and a view of the planner's recommend routed) we should have gone for the former, but I don't think we lost more than about 10 minutes on a 2-hour leg. A traverse of the Glaramara ridge was followed by the usual Saunders sadistic descent to the valley floor and straight up the other side, then finally a circuit of Ullscarf before a tricky steep and rocky descent to the last control and the finish – 7 hours and 44 seconds. We felt we'd done just about as well as we could given our fitness levels, and were pleased to be lying 14th out of 58. Alan and Peter arrived an hour or so later, 41st out of 104. Unfortunately Will had sprained an ankle so he and Graeme hobbled slowly home and couldn't continue on Sunday, but still managing to finish a creditable 39th on day 1 – without the injury they'd have been looking at a possible podium finish. The next day we were expecting things to be a bit easier, Sunday usually being an hour or more shorter than Saturday. More fool us. The route started up Dunmail Raise before heading back west via Easedale to Langstrath again, via an endless switchback of descents and reascents. A misjudged traverse (too high) round Bowfell slowed us as we picked a way through broken crags, after that exhaustion set in. A steep grassy scramble up the NW ridge of Kettle Crag (no, I hadn't heard of it either) led to another climb onto Lingmoor Fell for the sting in the tail, some orienteering-style micro-navigation to find a re-entrant in a bank of re-entrants, and a knoll in a field of knolls. We finally crawled across the finish line some 7 hours 48 minutes after starting. 22nd on the day, and 19th overall, but the most telling statistic is that there were only 29 finishers out of 58 starters! Peter and Alan appeared an hour or so later, with a final position of 48th out of 106 (61 finishers). Another great weekend, though the hardest event I've done for a long time. A few photos here – not many as I was too hot and bothered to take my camera out! Full results here and more details of the SLMM here. You are currently browsing the York Alpine Club Blog blog archives for July, 2011.